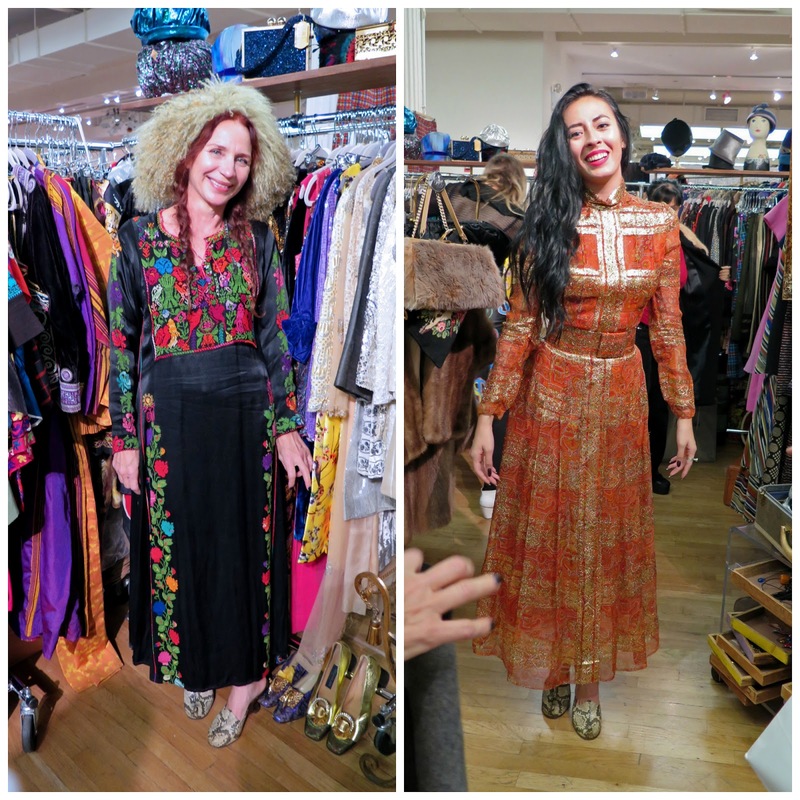 In addition to being a showcase of beautiful vintage clothing and accessories, the Manhattan Vintage Clothing Show is one of my favourite events because it attracts an eclectic group of folks who have unique personal style, and appreciate others who are not afraid to stand out. 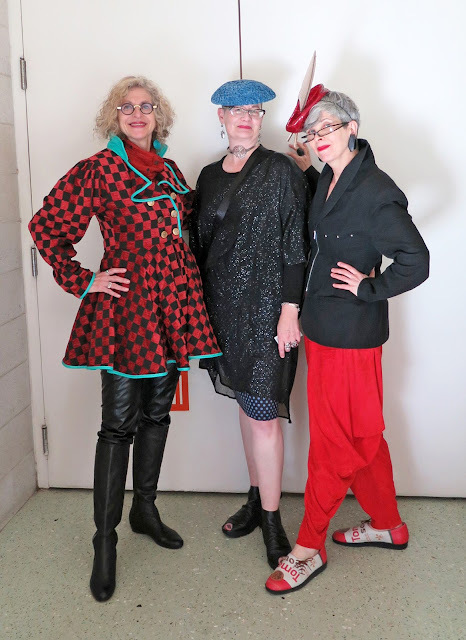 You know you are with "Your People" when you can spend 20 minutes enthusiastically discussing the details of a gorgeous hat or a spectacular coat with a complete stranger, and then compliment each other on what we're wearing. Valerie and I arrived at the Vintage Show on Friday just in time to run into Dayle (left), whose Instagram account (@artfulcitystyle) I had begun following a few months ago. I had commented that I would be in New York to attend the show, and that perhaps I would see her there. She had never been to the show, and at my recommendation she decided to go. 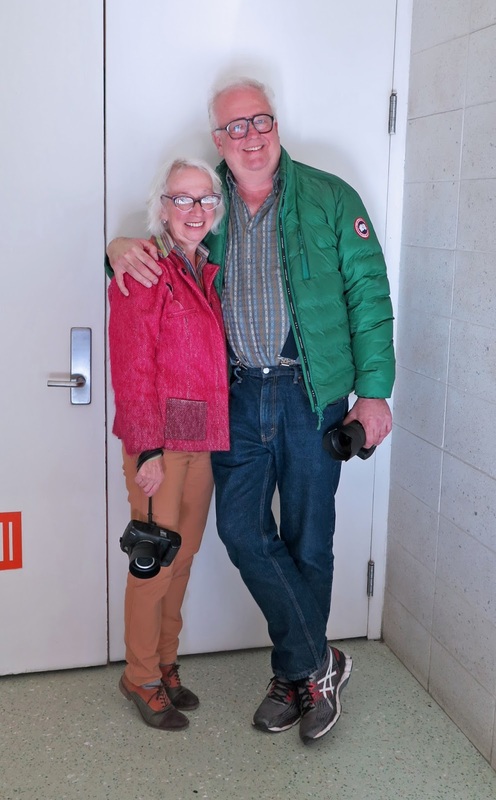 Accompanying Dayle was street photographer Denton Taylor and his wife Teresa. Denton shoots street style photos for the blog 40PlusStyle, and has taken numerous photos of Dayle. On day 2 of the show, Jean (the other half of The Idiosyncratic Fashionistas) and I were wearing our favourite colour. Valerie was the colourful one in our trio. She had purchased the feather hat the previous day from Revival Vintage. I was drooling (not literally, that would have been unpleasant) over her metallic purple Trippen shoes she had purchased while on vacation in Berlin. The show is a big draw for style bloggers and on Friday, I ran into Lyn, aka The Accidental Icon. I met her at the show last year when she had just started her blog, and in that short time period she has acquired a large following . We had an interesting chat about our respective blogging experiences. 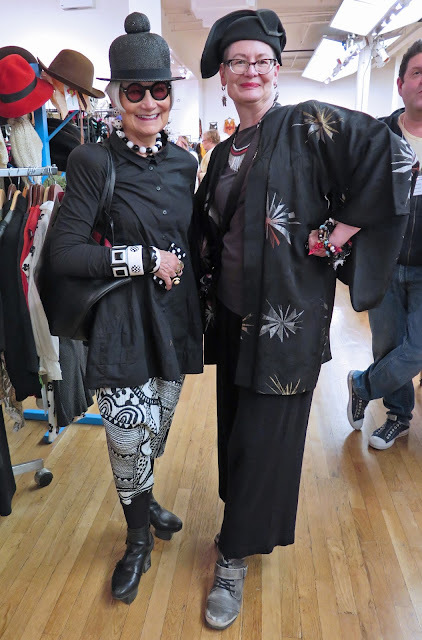 I had met Patricia Fox at the FIT Symposium the day before, and as luck would have it, we ran into each other again at the Vintage Show. She has a large collection of fantastical headwear that includes the egret-feather trimmed piece she was wearing that day. 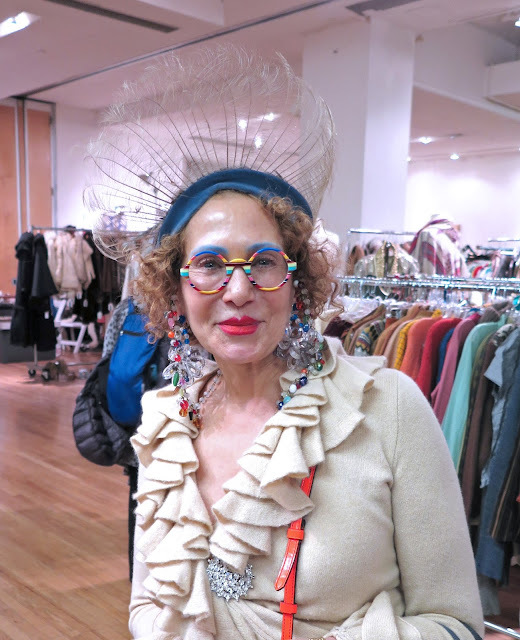 Fox often colours her eyebrows to match her outfit, and her colourful eyeglass frames add to her artful style. 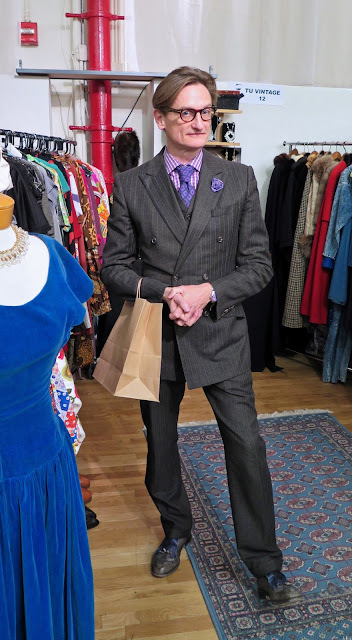 I had just heard Hamish Bowles, European Editor-at-large for American Vogue, speak at the FIT Symposium the previous day, so when I ran into him at the Vintage Show, impeccably dressed as usual, I told him how much I had enjoyed his talk, and he graciously posed for a photo. 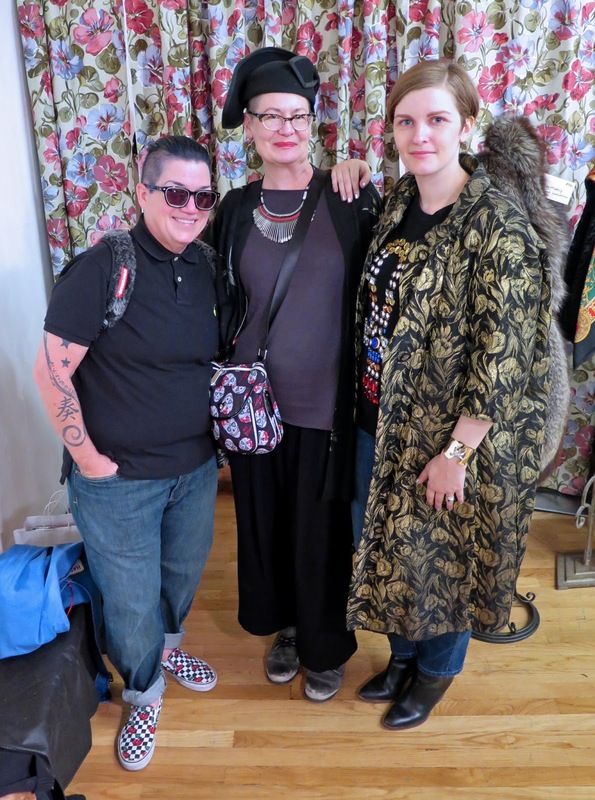 A big "SQUEE" moment for me on the second day of the show was running into actress, comic, and jazz singer Lea DeLaria and her fiancee Chelsea Fairless (whose instagram account, @female_trouble, is very entertaining). I will admit that I went a bit "fan girl" on her. I had seen Chelsea earlier in the day and had complimented her on the beautiful gold-embroidered coat she was wearing. Thanks so much to Jean for giving me the head's up that Lea and Chelsea were in the building, and documenting the moment! The women at The House of Findings booth were both beautiful, and beautifully dressed. Mayra Gonzales, on the left, is the owner, and she was such a delight to talk to. Her assistant, on the right, changed her outfit five times on the first day of the show. 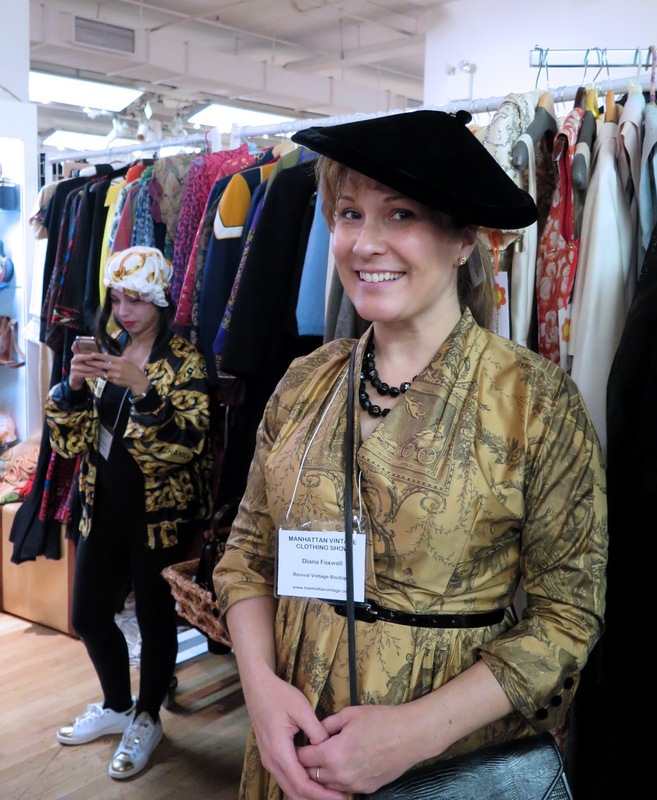 The booth had a nice mix of vintage and ethnic/global items, and I found a lovely vintage wool skirt, (lined, and with pockets!) for a very reasonable price. Regina, owner of Vintage Le Monde, is always modelling something fabulous from the stock in her booth. She demonstrated the superhero-style cape that was attached to the funky Rick Owens jacket she was wearing. 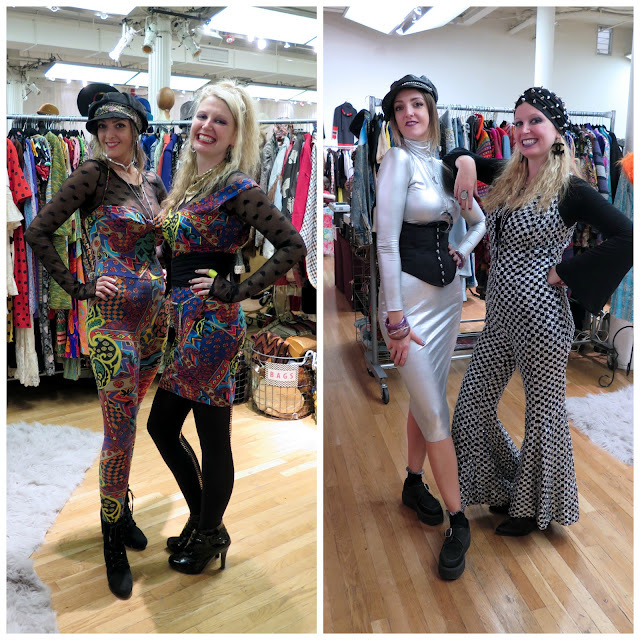 Spark Pretty owner Amanda Dolan (right) and her best friend Meagan (left) always wear sassy, coordinating outfits at the show. They have fun at the show, and make sure their customers do too. 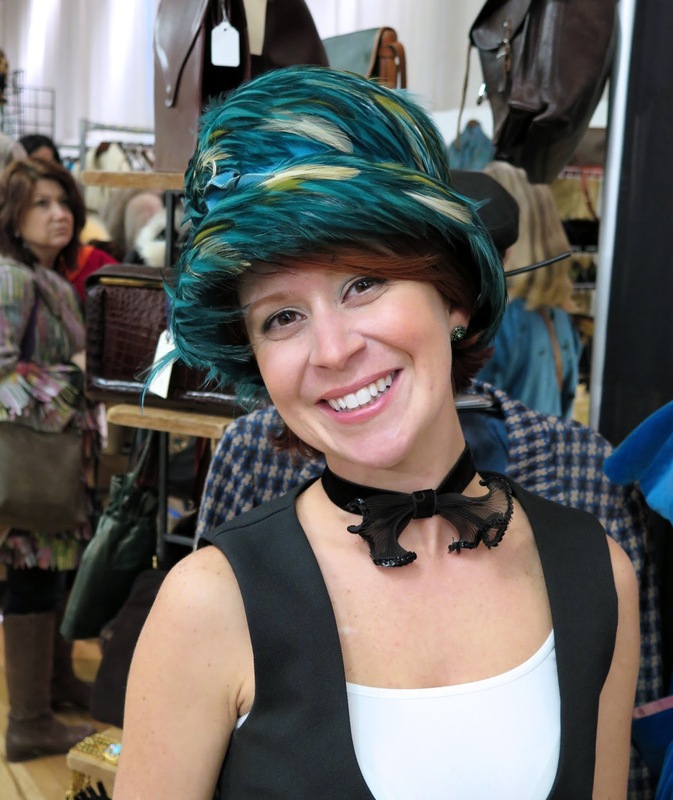 Not to be outdone, Sofia, owner of Tu Vintage, looked adorable in her feather-covered topper. Lisa, owner of Lisa Victoria Vintage has a great eye for beautiful pieces of clothing that are meant to be admired as much as worn. The embroidered jacket she's wearing is an example of the type of elaborately embellished pieces you can find in her booth. 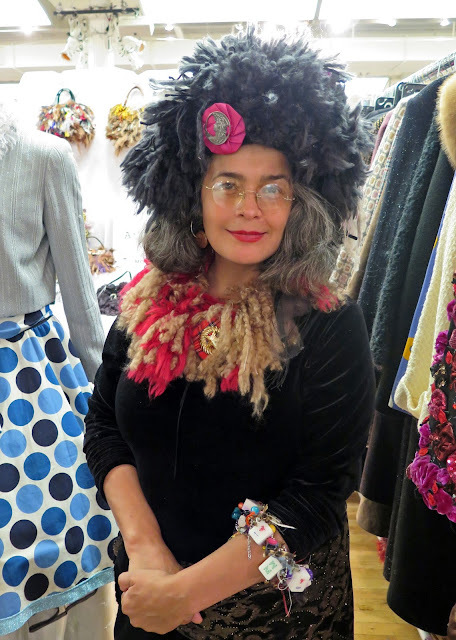 Carmen Bury, the woman who made the spectacular coat that I modelled on the first day of the Vintage Show (see my first post on the show), also makes accessories, and on Saturday she was decked out in her own designs, including a neckpiece that she wore as a hat. She and Mayra of The House of Findings obviously have similar taste in headwear! 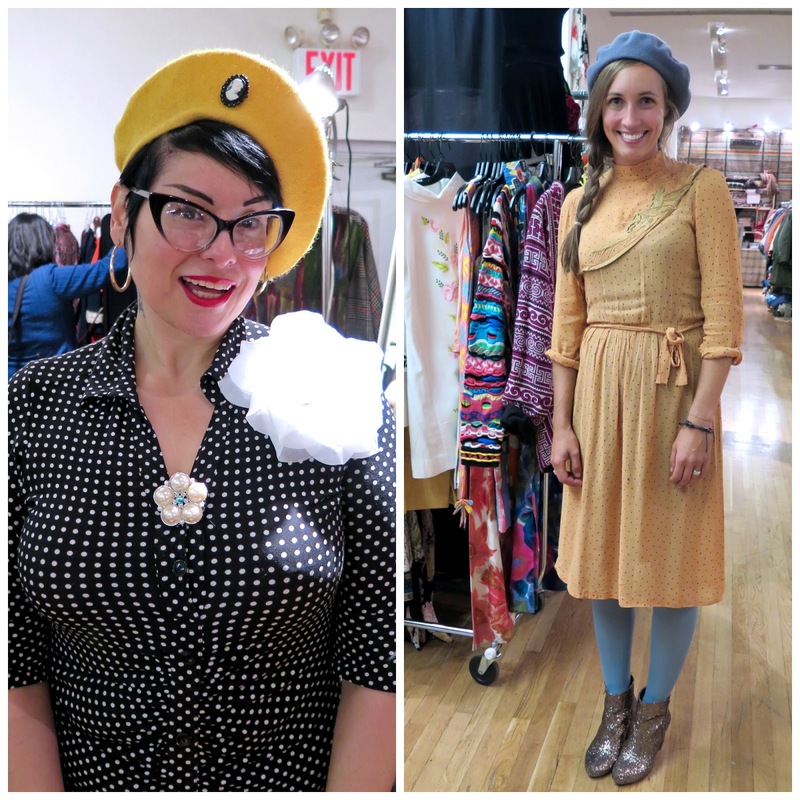 Diana, owner of Revival Vintage (right) was also wearing a hat from her stock. Her assistant (on the left in the gold and black) is an excellent photographer and was nice enough to take several photos of us while we were at the show. 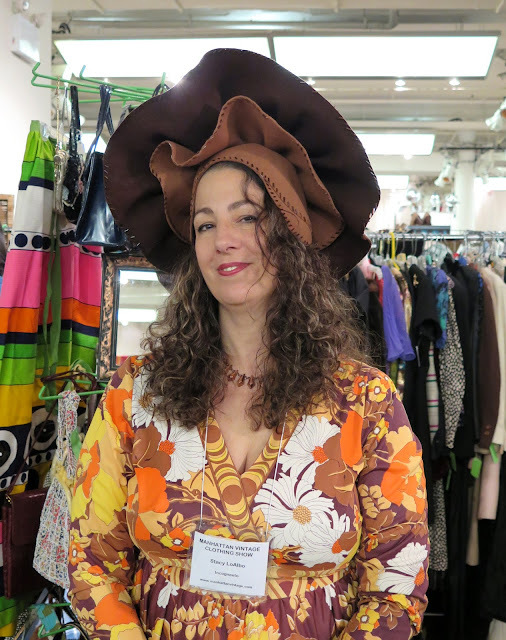 Diana has a great selection of vintage hats, and The Idiosyncratic Fashionistas have purchased a few hats from her. 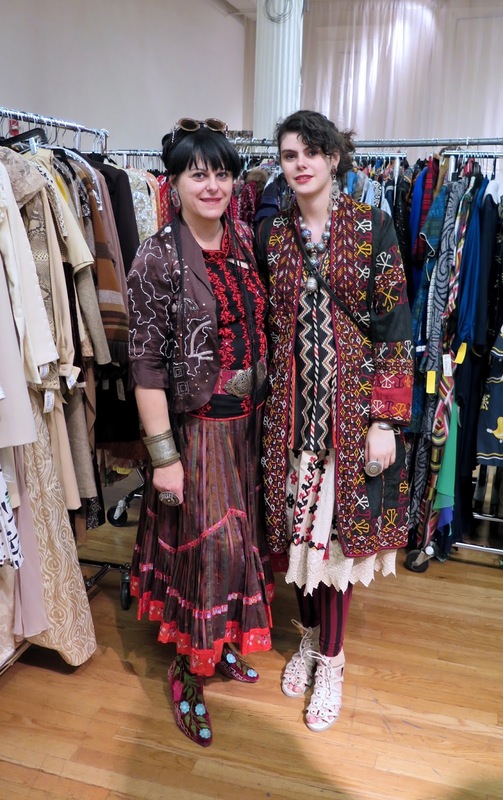 The eye-catching and original style was by no means limited to the bloggers and the vendors. 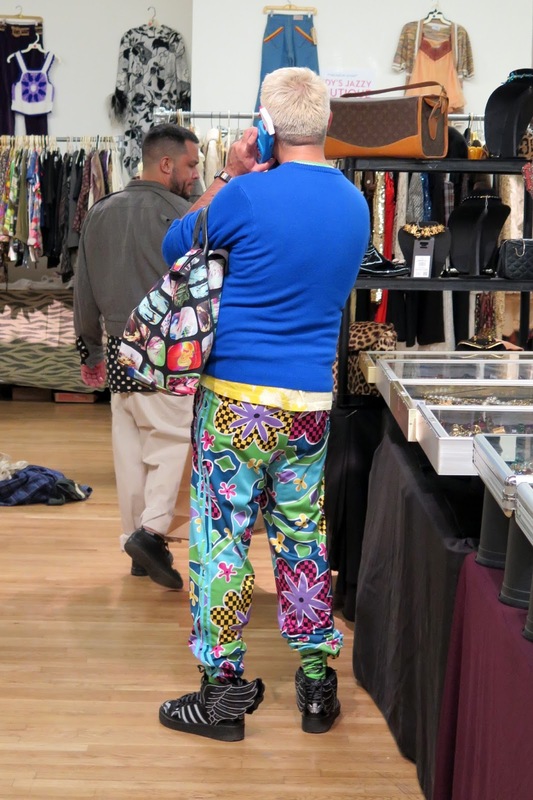 Many of the customers are walking style statements who come to the show for inspiration, or to add to their collection. 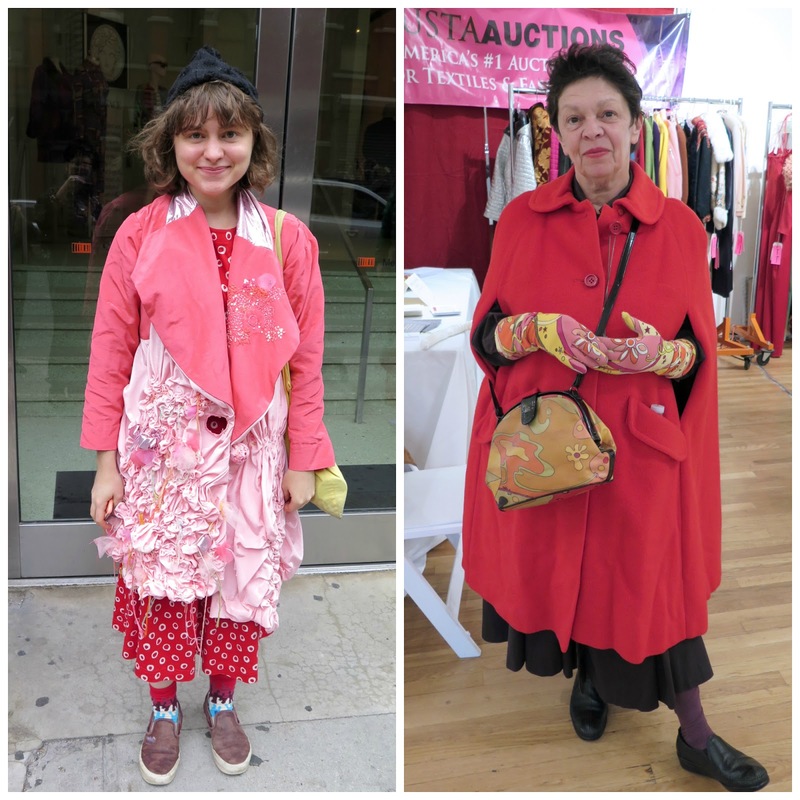 The young lady on the left made the coat she's wearing, and the red vintage cape on the right was the perfect layering piece for a cool fall day. 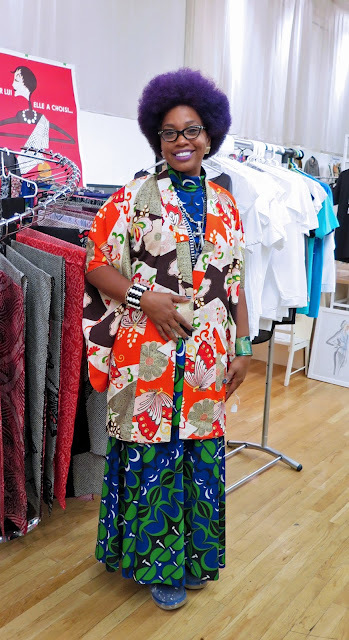 This woman was trying on the vintage Haori from one of the vendors and was going to take it off before I took her photo, but I rather liked all the colours, especially her purple afro! Roddy Caravella and his wife, Milliner Gretchen Fenston must be the best-dressed couple wherever they go. This guy caught my eye with his winged sneakers and colourful patterned pants and bag. These women show two ways of styling a beret with a dress, incorporating items from different eras. 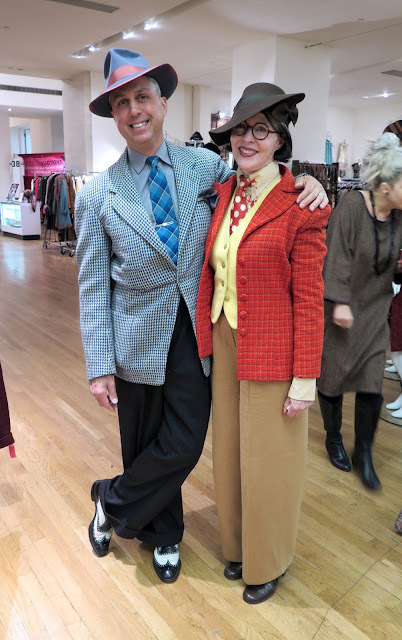 Dan, on the left, gets a number of his suits from one of the vendors at the show (Dan refers to him as "my suit guy"), and he always looks impeccable, right down to the little details like his tie clip. Gregory, on the right, is also a regular at the show. 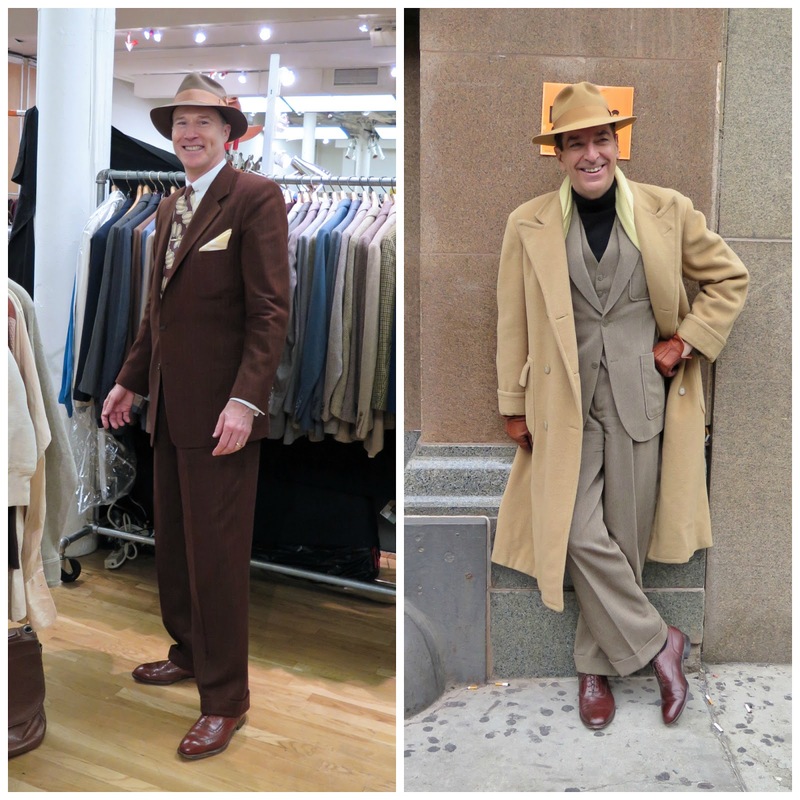 Seeing him in his three-piece suit, camel's hair coat and fedora made me think that although there were many terrible things about the 1940's, the way men dressed was not one of them. 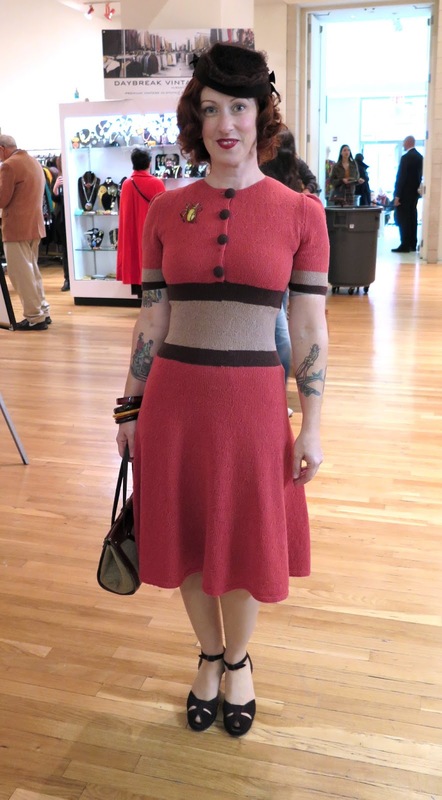 Martha is a regular at the Vintage Show, and loves wearing styles of the 1940's. I'm sure she has found many pieces in her wardrobe at shows like this one. She is even wearing vintage seamed stockings. Every year I see at least one little four-legged visitor at the show. On the left, a dog belonging to one of the vendors is unsure whether the white chihuahua is friend or foe. I thought it was kind of cute that the owner of the chihuahua is a very tall, strapping guy. 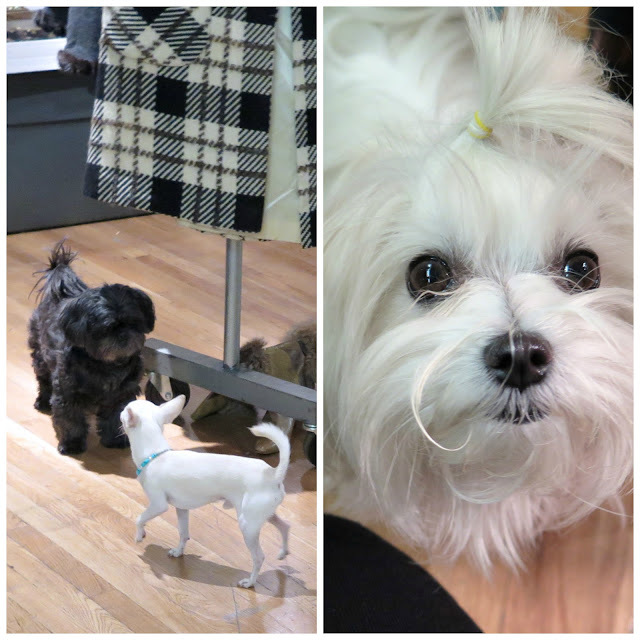 The cutie-pie in the right-hand photo is named Trip, and true to his name, is a very well-travelled little pup. Some of the head gear just took my breath away. That feather hat is sublime. I'm impressed with the men you captured as well. I am off to show my husband now. Love your reports on this event Shelley! My head spins with inspiration. I could get lost at that show. Your coverage is riveting from start to finish. How could one ever decide what to purchase if there's a budget and a bulging closet to think about? I don't have any favourites - it's all too overwhelming. Thanks for this, Shelley. 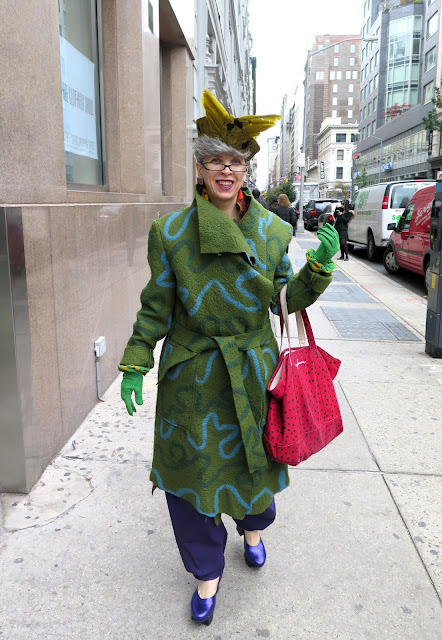 Wow, I love seeing all these creatively dressed people! I am now craving a pair of Trippens - so fun! Thank you for letting us come along with you! I misread, and thought the title was Birds of a Feather Frock Together. Which would have been totally appropriate too. I laughed out loud at my mistake. Must be getting old. Such a pleasure meeting you and everyone! 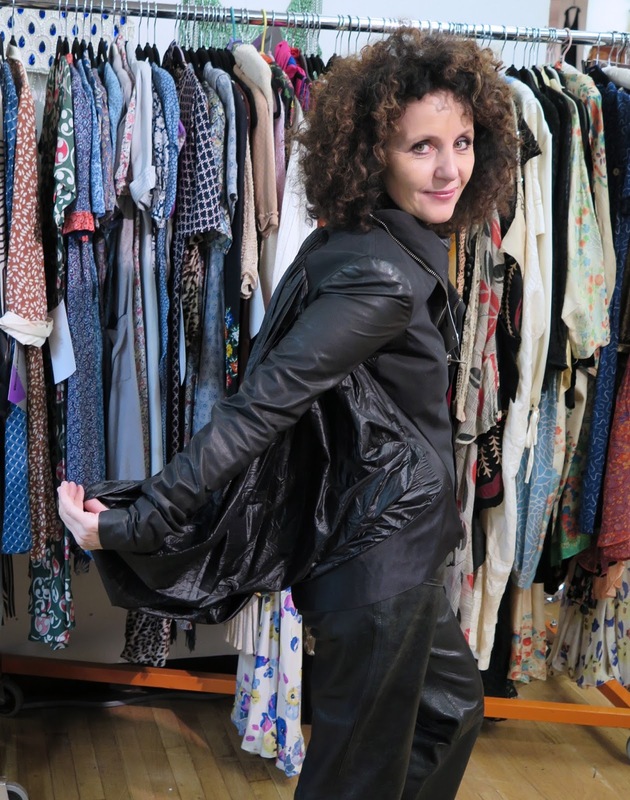 And Dayle says: "thanks for the mention and it was great to meet you!" (she doesn't have any blogger IDs). Fantastic post! Every photo is breathtaking and a feast for the eyes. The people, the pieces for sale, the hats, the outfits, and you! Thanks for providing the perfect read with my early morning coffee! What a cool, colourful and fabulous post. no boring dressers there. What a wonderful change from the usual dull dressed people. Oh these vintage do's you go to... they are so splendid. And you also get to meet such inspiring people. Such fun. I also love that black/gold coat of Chelsea. And I adore the dress of Mayra Gonzales, although it would only fit and suit someone with size zero. Never mind... great to look at. Funny to realize that I am oceans away but already "know" a lot of the people you met.